Jenny Uglow's book The Lunar Men, about a group of scientists and industrialists during the eighteenth century, fascinated me when I first read it. I've thought and spoken about it many times in the decade since then. As I was reading again, I noticed that the above paragraph particularly illustrates how the author combines descriptions of the domestic lives -- including wives and many children -- of the famous group members. My memory of this as a very amazing book was confirmed by my rereading. I wrote a very detailed review of it on my other blog at the time, and I've decided to reproduce it now. 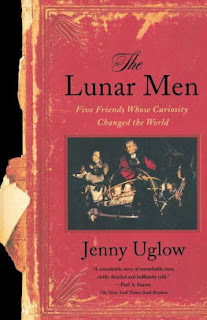 Blog post from August 29, 2007, "Lunar Men"
I just read The Lunar Men: Five Friends Whose Curiosity Changed the World, by Jenny Uglow. The subject is a group of remarkable 18th century colleagues, whose accomplishments contributed to scientific, social and technological change in their time. Seeing history from this perspective contrasts to the many literary-focused books I've read: though it mentions Blake and Coleridge it's just not about that side of the century! In its 500 pages, the book covers a great deal of the political, commercial, and scientific history of England in that century, making it both fascinating and challenging. The Lunar Men were ahead of their time with creating new inventions and processes, they contributed to emerging explanations of natural phenomena like electricity, and they were in on the era's important discoveries about plants, human biology, and geology. They met Benjamin Franklin and the French chemist Lavoisier; they read works by Linnaeus and other scientists outside their circle. Joseph Priestley (1733-1802), a scientist best-remembered for experiments with oxygen, who was also a social activist. Josiah Wedgwood (1730-1795), founder of the famous pottery works but also an experimenter in chemistry and developer of industrial and crafts processes. Erasmus Darwin (1730-1802), recognized for his skill as a physician as well as for his works about the natural world. Darwin's son married Wedgwood's daughter, making them co-grandfathers of Charles Darwin. James Watt (1736-1819), scientist and inventor of steam engine technology. Matthew Boulton (1728-1809), innovative manufacturer of consumer goods and industrial equipment. He partnered with Watt in developing steam power, and did many other things such as found a mint with new efficient coin-stamping capability. Theirs was the era of the Industrial Revolution, the American Revolution, and the French Revolution. They were engaged by all three. Although there were many differences of opinion among the Lunar Men, a prevalent reaction on their part was sympathy for the working man and for the new ideas about liberty, freedom of speech, and human rights. Most agreed with many ideas of reform and especially opposed slavery, though were uneasy with violent revolution. Even more ironically, the common men in England opposed revolution and favored the old monarchy and fundamentalist religion. The masses hated the Lunar Men, who were well known for their various accomplishments and controversial ideas. They blamed them for being "philosophers" and for their suspected sympathy with the French revolution. On one sad occasion, a mob burned Priestly's house and destroyed his library and laboratory. Darwin, two generations before his grandson, already proposed that the layers of stone and fossils he observed were millions of years old -- opposing belief in the Biblical creation story and its 6000 year age for the earth. He was one of the first to describe geological strata including prehistoric bones, and suggested an early version of evolutionary theory. Among the many fascinating themes of Uglow's book, I find great appeal in how similar are some of the issues these men fought to issues still not resolved in our own society. We should know better by now, after 200 years!